The S 34 chair by Thonet is a continuation of the S 33 model, the first cantilever chair of all time. It was designed by Mart Stam, the artistic inventor of the cantilever chair. The S 34 cantilever chair with armrests is made of a bent steel tube frame, which is available with a chrome-plated or lacquered finish. The seat and back surfaces out of leather or durable mesh complement the frame perfectly. Armrests made of plastic or wood complete the mix of materials skillfully and offer additional comfort. As a classic Bauhaus design, the S 34 excels with comfort and timeless charm so that the areas in which the cantilever can be used are as diverse as the variants themselves. Whether as a conference chair, a seat for the dining room or a chair for the waiting room, the S 34 Thonet Chair is particularly versatile thanks to its straight-lined design. Details The leather upholstery can be tightened with a bracket (beneath the seat). Glides are not included. 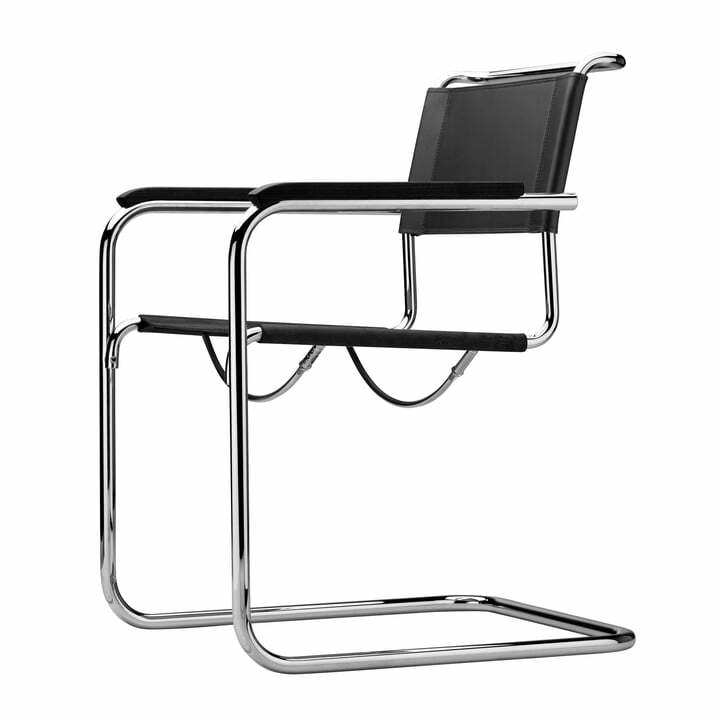 The S 34 chair is a piece of design history and was designed by Mart Stam in 1926. The S 34 is a version of the S 33 chair with armrests, the first cantilever chair in the history of time.